The audience jumped with joy when they saw their favourite singer.the rock star Neil Khanna appeared on stage.When he smiled the audience cheered up for him.When he gave flying kisses to the audience there were many girls to catch them.But those flying kisses reached the heart of one girl who was among the audience.She is none other than Avni Mehta. Neil observed the girls over there. He said in his mind:I know Avni..you are also here to watch me perform.I know that you are the first one to catch my kiss.But why I am not able to identify you? Avni was hiding herself behind some people over there. Avni smiled:Our first meeting should be special.If you see my face now you will identify me as my face is filled with love for you.If you find me today our meeting will be ordinary.One day I will come before you.Wait rock star Neil Khanna. 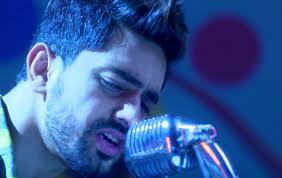 Neil smiled saying in his mind:This song is dedicated to you Avni.Wherever you are this song will reach your heart from my heart. Avni was immersed in his magical voice. She blushed thinking:I know Neil…this song is for me. Avni is crazy about Neil because of his beautiful voice.His songs made her fall in love with him.Like any fan she sent him gifts.In the beginning Neil just took it as a fan’s gesture.But later on when he kept receiving gifts from her on every special occasion he started noticing her.Without seeing her he started adoring her.Then Anvi took the next step by chatting with him online.Though Neil always gets messages from his fans online only when he noticed Avni’s message he started chatting with his fan ie Avni.As time passed they started having voice chat.Their friendship grew stronger and cuter. Her father Ashish:How was Neil’s concert? Avni:As usual it was rocking papa.His sang a song specially for me. Ashish:Really?Is he falling in love with you? Ashish:I don’t blame Neil for falling in love with you.Because you are the most beautiful girl in this world. Her mother Neela:But how does Ashish know that Avni is beautiful?He has not seen her yet.Did you reveal yourself to him today? Neela:Poor guy.Today also he could’nt see how his Avni looks like.Avni…please don’t make him wait too much.He deserves to see your face.Don’t do this to him Avni. Avni:Maa,am I troubling him too much? Neela:If you don’t show your face to him…yes in a way you are torturing him. Avni showed her a puppy face.Ashish and Neela felt like laughing seeing her facial expression. Avni and Neil started chatting. Neil:So as I expected you came for my concert. Avni:Yes.How can I miss your concert?I don’t miss any opportunity to see you. Neil:Did you hear my song Neela neela…? Avni smiled:Of course yes.I loved it.It was beautiful.It was for me.Right? Neil was surprised:How did you understand that it was for you? Avni smiled:Even if you don’t open your mouth to me I can read your heart.You may be silent.But still i can hear you.Your silence is enough for me to understand your heart. Neil smiled:No one else has understood me like you Avni. Neil:Avni…you love music.You also sing.Then why are you not doing stage shows? Avni:I sing for my own pleasure.No need to sing in public. Neil said in his mind:First let me make you mine.Then I will make you sing for me.Then I will expose your singing talent to the public. Neil:Avni..I feel jealous of you. Neil:You can see me whenever you want.But I can’t see you. Neil:Please stop it yaar.I am craving to see you.I am desperate to see you.Please don’t play with my emotions. Avni felt pity towards him.She remembered Neela telling her not to make him wait too much to see her face. Avni:Ok.I will put an end to your waiting.I will show you my face. Neil was excited:Really? ?Thank you so much Avni. Kehne do inko zaraa.. haa..
Avni clicked the video chat option and slowly her face was disclosed to him. Neil was lost in her beauty. Neil:Avni…you look beautiful and sweet like your voice. Neil:I think now onwards this beauty will enter my dreams daily. Avni switched onto voice chat again. Neil:What yaar?Why did you stop video chat?I could’nt see you enough. Avni:This is enough for now.If you see me continously like this there won’t be any excitement in our first meeting. Neil:Means finally you decided to come in front of me? Neil:Wow Avni.I can’t wait for that moment.When will we meet? Neil:I can’t wait till Sunday. They discussed the venue and cut the call. Neil and Avni were blushing thinking of how Avni revealed her face to Neil and how Neil admired her beauty. They both went to the dream world thinking of dancing with each other. Baahon Ke Darmiyaan Do Pyaar Mil Rahe Hain Baahon Ke Darmiyaan Do Pyaar Mil Rahe Hain Jaane Kya Bole Mann Dole Sunke Badan Dhadkan Bani ZubaanBaahon Ke Darmiyaan Do Pyaar Mil Rahe Hain Jaane Kya Bole Mann Dole Sunke Badan Dhadkan Bani Zubaan Baahon Ke Darmiyaan Khulte Badn Hote Labhon Ki Ye Ankahi Khulte Badn Hote Labhon Ki Ye Ankahi Mujhse Keh Rahi Hai Ki Badhne De Bekhudi Mil Yoon Ki Daud Jaayein Nas Nas Mein Bijliyaan Baahon Ke Darmiyaan Do Pyaar Mil Rahe Hain Jaane Kya Bole Mann Dole Sunke Badan Dhadkan Bani Zubaan Baahon Ke Darmiyaan Aasmaan Ko Bhi Ye Haseen Raaz Hai Pasand Aasmaan Ko Bhi Ye Haseen Raaz Hai Pasand Uljhi Uljhi Saanson Ki Aawaaz Hai Pasand Moti Luta Rahi Hai Saawan Ki Badliyaan Baahon Ke Darmiyaan Do Pyaar Mil Rahe Hain Baahon Ke Darmiyaan Do Pyaar Mil Rahe Hain Jaane Kya Bole Mann Dole Sunke Badan Dhadkan Bani Zubaan Baahon Ke Darmiyaan…(Khamoshi). Neil and Avni were excited for the first meeting. Avni was searching for a dress in the cupboard. Neela:You did’nt select a dress yet? Avni:No Maa.I am not able to.I am confused.But i want to look the best today. Neela:You wear anything…but you will look the best. Ashish:As you are the best. Neil was looking at his wardrobe.His sister Tapasya and brother in law Raghuvendra ratap Rathore came. Tapasya:You have not shown this much interest in dressing even for your stage shows and TV interviews. Raghu:Tapasya..try to understand …he is meeting his beloved for the first time.He should look like a Prince. Tapasya:My Neil is the best looking.He looks more handsome than all the fairy tale Princes. Tapasya:Neil..you have already conquered her heart.So you wear anything. Avni took bath enjoying in the water. She brushed her hair and twirled it around. She wore a beautiful dress after trying out many dresses. Neil took bath.He imagined Avni too with him under the shower. He felt shy at his naughty thoughts. Neil wore a dashing attire. He danced around in excitement. Neil:Avni..today I will confess my love to you. Avni:Neil..today I will confess my love to you. Avni and Neil drove their car to the venue.Avni was stuck in the traffic block. Finally she reached there.She could not find Neil there. She tried to ring up Neil.But it was switched off. Avni:Guess not seeing me here he got angry and left.Why can’t he have some patience? Avni got angry and she went back home. Ashish and Neela were worried to see Avni. Avni:Don’t ask me about Neel.I did’nt meet him today.Due to traffic jam I got late.Guess the attitude wala rockstar has no patience to wait for his fan.So he left.He did’nt even want to attend my calls.IN anger he switched off his phone too. Ashish and Neela became upset. Ashish:Avni..you are misunderstanding Neil.Neil did’nt get angry with you or left.No man can get angry with the girl whom he was going to meet for the first time.Neil was desperate to see you.So he would have waited for hours and days for you.But he would not have gone back without seeing you. Such a fab ff I have never read. It was beautiful, amazing and rocking. Just loved it. And sorry for late reply. ShraddhaSharma392 on What’s your take on new entry in Krishna Chali London? manishat on Kulfi Kumar Bajewala 25th April 2019 Written Episode Update Kulfi unable to talk or sing.